The Japanese tyre manufacturer has made quite an impressive start in life with their innovative tyre designs that has gained them critical acclaim. Although they are a small company in relation to some of the more established brands, they can still hold their own and have even joined the famous Nurburgring 24 hour race for the first time in a bid to show off their European flagship tyre - the FK45. The brand, which has been around since 1983, has gained in popularity in recent years thanks to their cutting-edge designs. They have assembled a team of some of the finest tyre technicians around and most recently they created a new system that monitors the tread depth of a tyre and warns the driver it reaches a dangerous level. Whether you own a car, a motorcycle or even a 4x4, then Falken are sure to have tyre that suits you that can bring out the best in your vehicle. 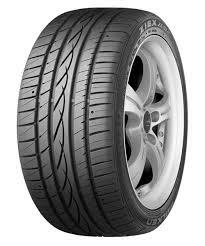 What are some features associated with Falken tyres? If you have been left a little frustrated looking for a great deal on Falken tyres, then the team at Easywheels can give you a helping hand. Purchasing new tyres can often be a quite expensive process, often leaving many people feeling they have been left out of pocket, but at Easywheels we are here to help you. We can provide you with great quality tyres at the right price, all of the highest standards in term of quality and durability. So what are you waiting for? Call the team today on 0333 9000 201. The Falken ZE912 tyres are a great choice for a large range of vehicles as not only are they available at a great price but their durability and levels of performance are incredibly high. You’ll enjoy a much longer lifespan with these tyres and they can handle whatever you put them through. With excellent water drainage and very responsive steering, every journey will be a lot more enjoyable and relaxing no matter what you drive, where you are going and why. Don’t miss out on the ZE912 tyres from Falken.